We had such high hopes for Palace of Spies, the first book in Sarah Zettel's new YA trilogy. Zettel's writing is consistently solid, she chose an unusual time period for her setting, and she avoided the cover art controversy that has dogged her otherwise-excellent Dust Girl books. The end result, sadly, fell a hair short of our dreams, but let's face it: even Zettel's B-grade work still stands head and shoulders above most teen fiction. As an impoverished, orphaned gentlewoman in early 18th century London, 16-year-old Margaret Fitzroy knows her chances of making a good marriage are slim. But when she refuses to marry the brutal, lecherous Sebastian Sandford, Margaret is stunned by the speed with which her hardhearted guardian kicks her out of his house. Almost immediately, however, she is "rescued" by the mysterious Mr. Tinderflint, a kindly-seeming stranger who claims to have known her mother. Unfortunately, Mr. Tinderflint wants something in return: for reasons he refuses to explain, he needs Margaret to impersonate Lady Francesca Wallingham, one of the Princess of Wales's ladies-in-waiting, who has recently (and secretly) died. Seeing no other option, Margaret takes him up on his offer... and promptly finds herself up to her neck in all sorts of palace intrigue—personal, political, and romantic. 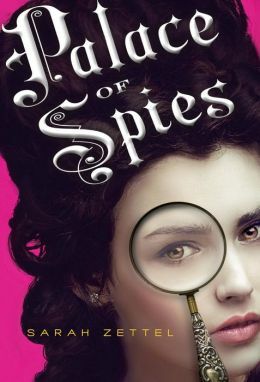 Palace of Spies zooms along at a breakneck pace, and, unlike many series installments, features a satisfying beginning, middle, and end. Admittedly, a lot of the narrative strains credulity, and the romantic storyline never really gets off the ground, but Zettel's vivid descriptions of the clothing, behavior, and political jockeying of early 1700s England go a long way toward smoothing over the novel's rough patches. Best of all, Margaret is a tremendously engaging narrator, alternately prudent and daring. Her adventures might be ridiculously far-fetched, but her clever, practical voice is appealing enough to disguise that fact.